Encore Models is a brand of kits produced by Squadron/MMD by combining their own resin parts and decals with an existing kit and adding a few other enhancements along the way. In this case, Encore Models took the Roden 1/32 Pfalz D.III kit, added some nice resin produced in-house, added photo-etched parts produced by Eduard, and here you have a special kit with some interesting options. The kit is molded in light gray styrene and presented on seven parts trees plus 32 parts cast in grey resin, seven parts cast in tan resin, and one fret of photo-etched details. Markings are provided by Aeromaster Decals (another Squadron/MMD brand). The movie version is the one that is tarted-up with the lozenge camouflage while the literary version mirrors the historical version, both of which wear an overall silver dope finish. No matter which version you choose, this kit provides some very nice details for all three and clearly produced instructions to walk you through the changes and enhancements to get you to your selected version. The instructions also provide rigging details so you can complete your project realistically. 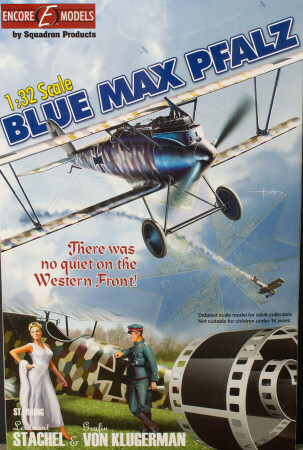 As depicted on the box art, this kit provides resin figures for George Peppard as Corporal Bruno Stachel and Ursula Andress as Countess Kaeti von Klugermann. These will provide a nice vignette to display the movie or literary versions of this kit. If you're looking for a fun project that replicates an aircraft off the big screen, this latest Encore kit is just the kit. My sincere thanks to Squadron/MMD for this review sample!